This paper examines whether, and to what extent, the spot LNG markets in different regions (East Asia, Iberia, Northwest Europe, and South America) are integrated and how market integration evolves over time. We first lay out a framework of market integration in the context of global LNG market where the main supplier (e.g. Qatar) may have market power. Estimating a time-varying coefficients model, we find that a varying degree of market integration exists between all four LNG indices particularly after the Fukushima incident in 2011. We complement the time-varying coefficient analysis with a test of price convergence among the LNG indices using the Phillips-Sul (2007) methodology. The results reveal that, there is strong evidence that the spot LNG prices are converging after the Fukushima accident and they are also converging with the price of NBP in the UK. The empirical result is consistent with the change of market power of the main supplier. 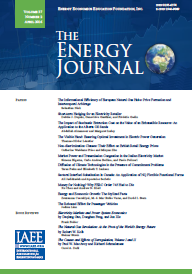 EJ - Linking Natural Gas Markets - Is LNG Doing its Job?